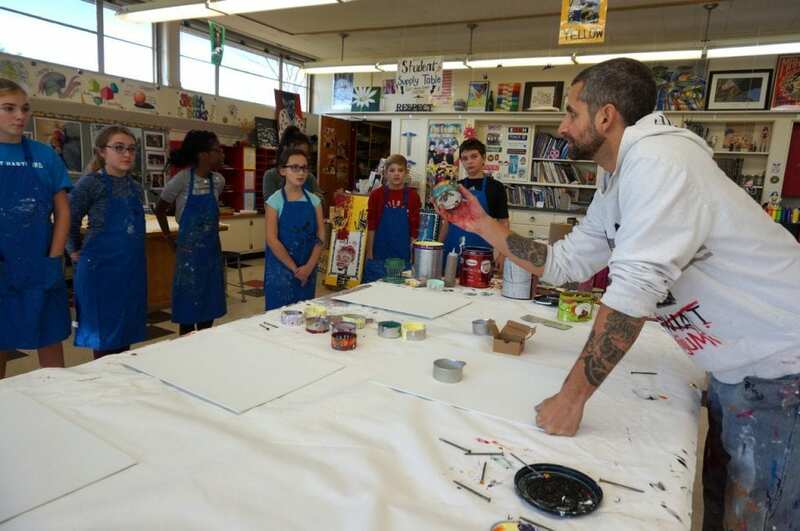 Michael Justino Michaud, known in the art world as Mijumi, visited King Philip Middle School, in West Hartford, with the goal of showing students that anything could be considered a canvas. 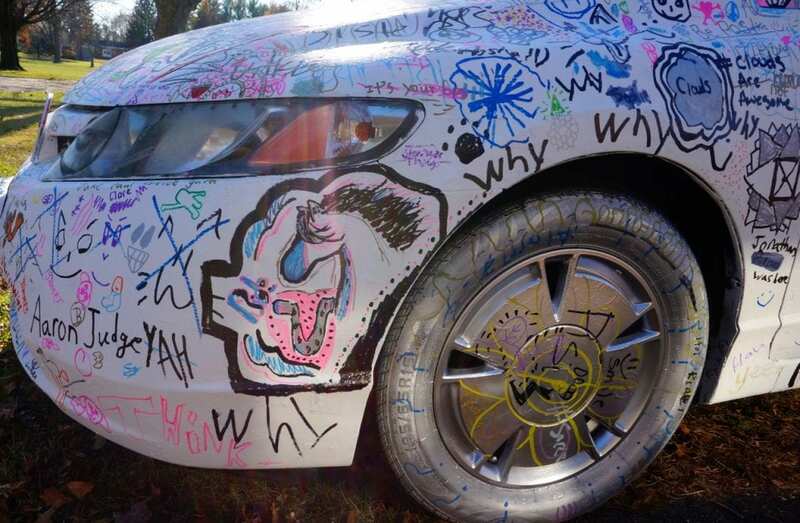 That includes his car, which he allowed the young artists to draw all over with markers. He brought in some of his unique work – which he describes as “organized chaos” – to further prove that point. He has tables he took apart and turned into a canvas. His canvas might be another artist’s work. Sometimes, his canvas might have been found on the side of the road. 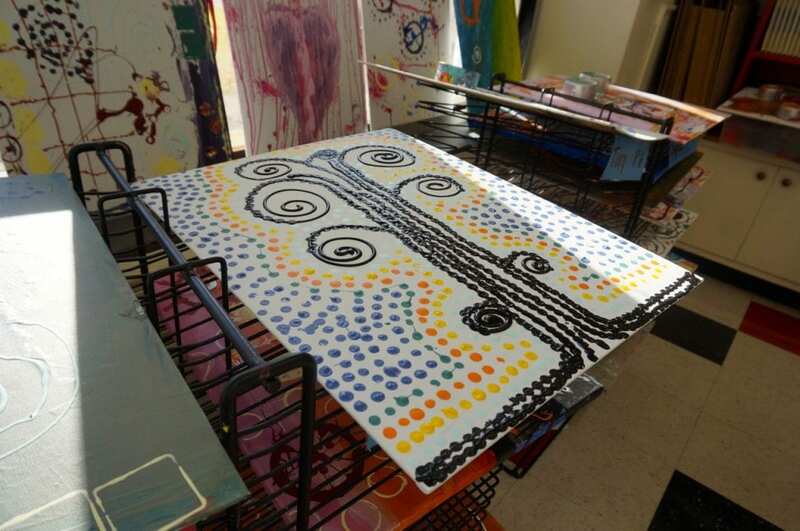 On the second day of his visit, the students were using a more typical canvas, but their paintbrushes were far from traditional. They were using lids that belonged to ice cream packaging, pieces of wood, nails, pieces of metal. The students were using the items as stamps to create patterns. Stacey Grindle invited Michaud into her sixth grade classroom through a grant provided by the Foundation for West Hartford Public Schools. Grindle, who also lives in Enfield, wanted to bring the chaos part of Michaud’s work to her student’s attention. 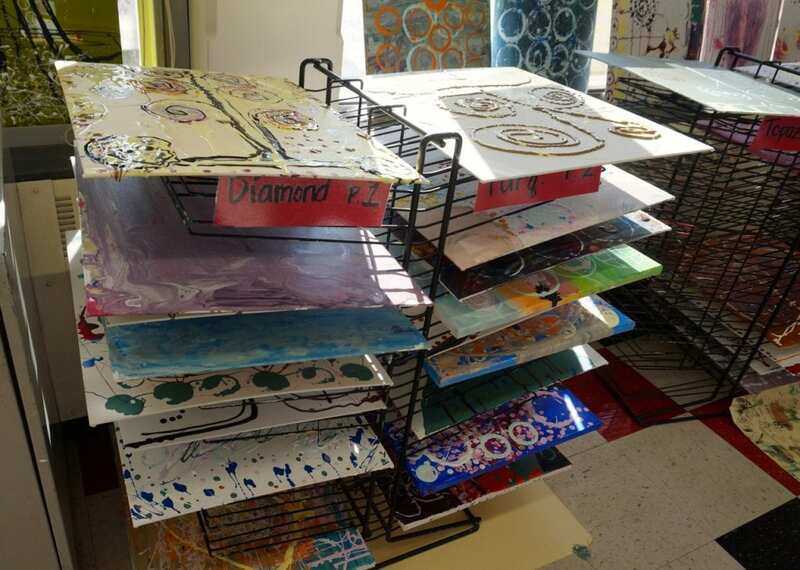 Grindle said she felt that Michaud’s style would lend well to her classroom. Michaud said he always enjoys hearing the reactions to his work, especially from younger people. “It’s cool to hear the reactions from people, and to see the reactions these guys are giving is so rewarding,” Michaud said. Shortly after saying that, Michaud was approached by a student who asked him about one of his works he brought into class, starting a dialogue between the two. And that’s why he said his visit to Grindle’s class is extra inspiring in that regard. Grindle thinks that inspiration traveled back to her students. 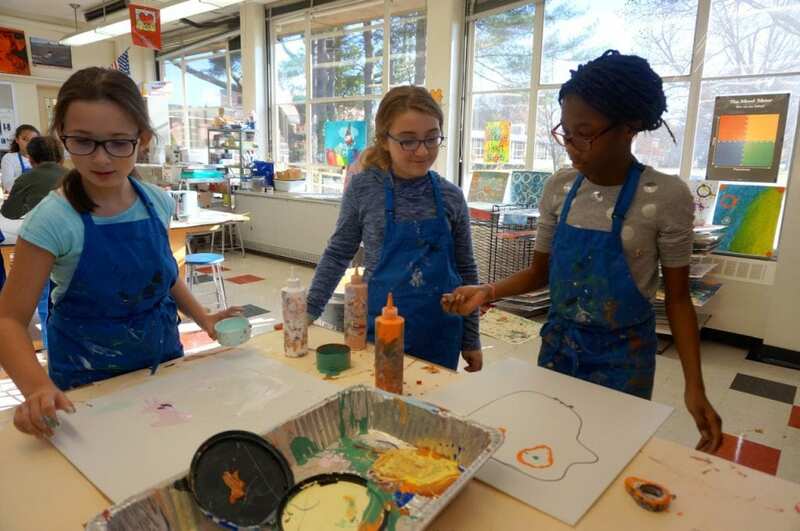 Visiting artist Mike Michaud allowed King Philip sixth graders to paint his car, and spent several days working with the students through a grant from the Foundation for West Hartford Public Schools. 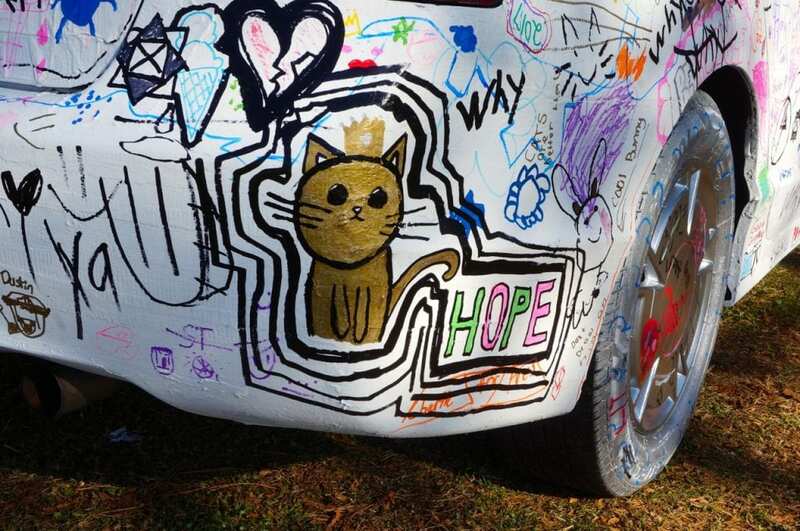 Artist Mike Michaud’s car is newly-painted, and for the next several months he will be proudly driving around in a 2007 Honda Civic bearing the artwork of Stacey Grindle’s King Philip sixth-grade art students. 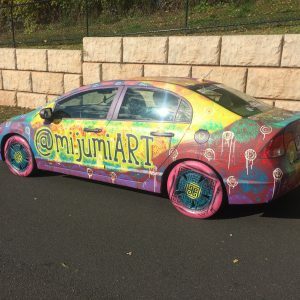 Michaud, aka “Mijumi,” spent several days at King Philip Middle School this week inspiring students’ creativity – in the style he calls “organized chaos” – including allowing them to paint the car he drives every day. 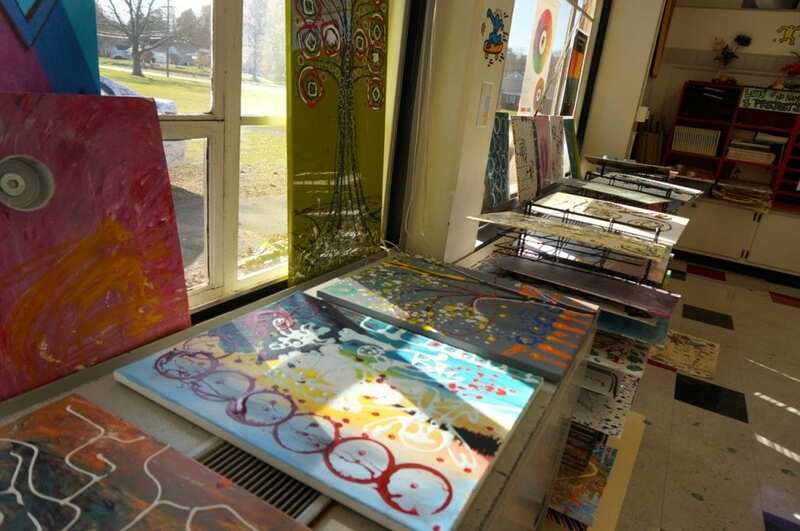 The project was funded by the Foundation for West Hartford Public Schools “Dr. 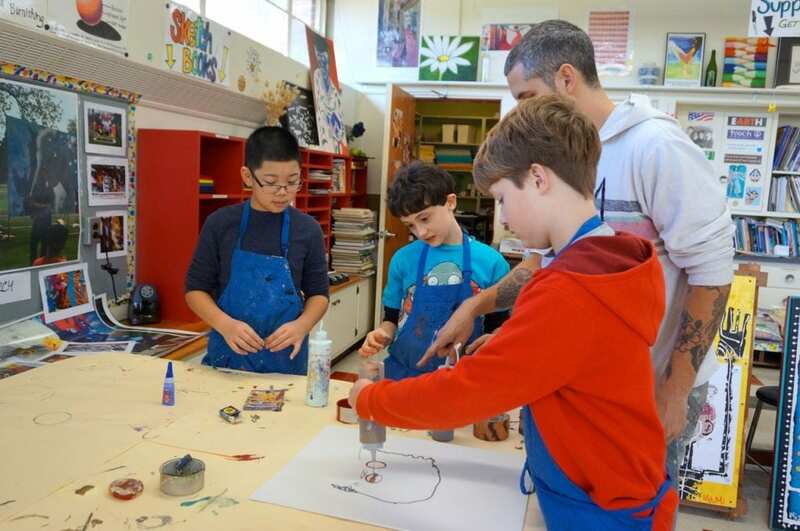 Robert & Gladys Dunn Grant,” with the goal of inspiring the students in Mijumi’s “style of mark making and patterns while connecting to culture and heritage,” using everyday and found objects in their art, including as painting materials. Michaud said he has painted his car – which started out a coppery color – several times, and once wrapped it with duct tape, but this is the first time he has allowed anyone else to do it. 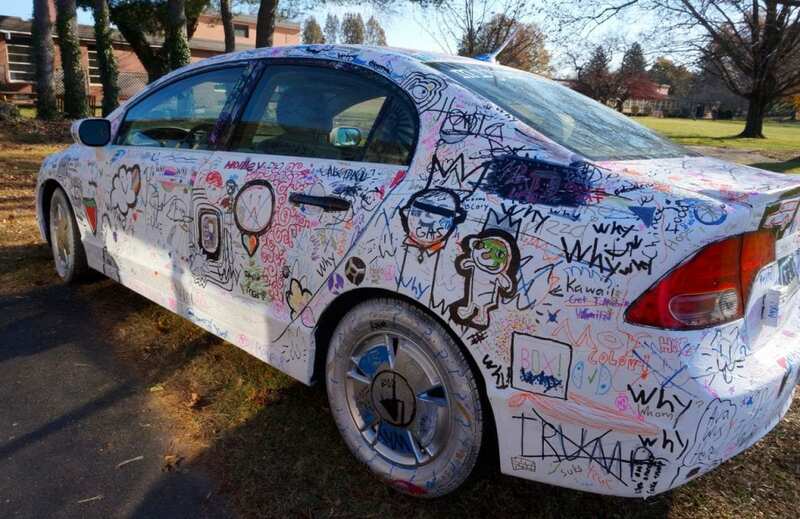 He covered the car with white exterior house paint and even spray-painted the wheels to create the canvas for the students before he arrived at King Philip. 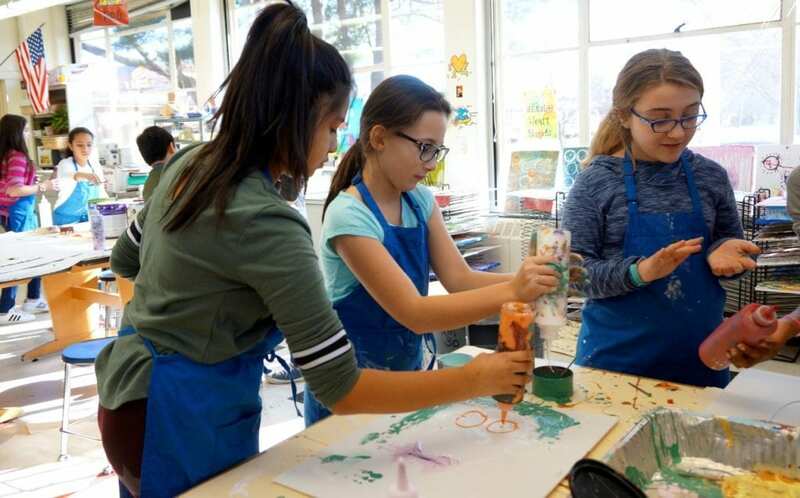 On Monday, all of the sixth-graders who have art during this rotation – about 125 students – had a chance to write or draw on Michaud’s Honda with Sharpie oil markers, brainstorming for some of the art they would create in the classroom on Tuesday. “I basically said, ‘This is your sketchbook,’” said Michaud. 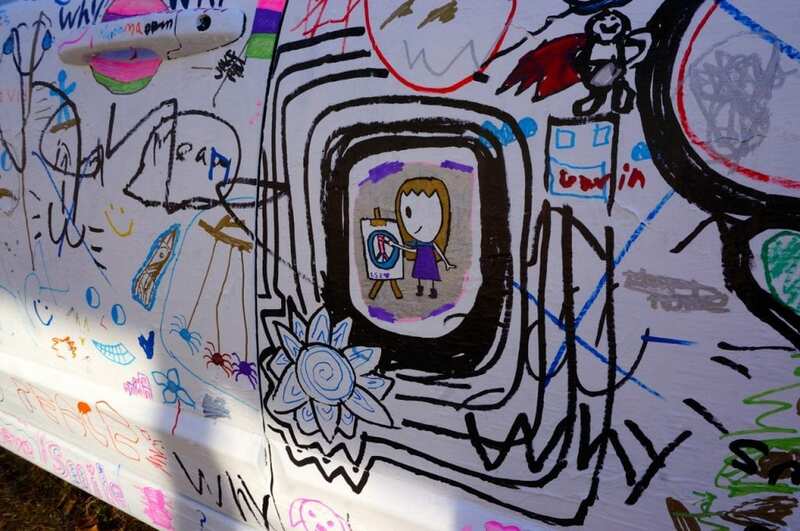 But as the art car project progressed, he decided that he didn’t want words and asked the students to use just images or logos. He outlined some of his favorites, including a cat and a horse. He said he doesn’t plan to repaint the car until next April. 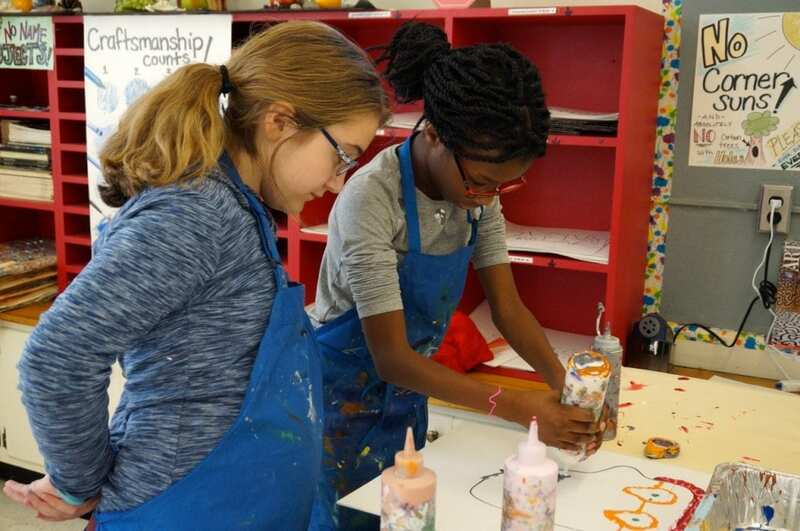 “My personal goal is to show them they can use anything as artwork, anything as a paintbrush,” Michaud said. 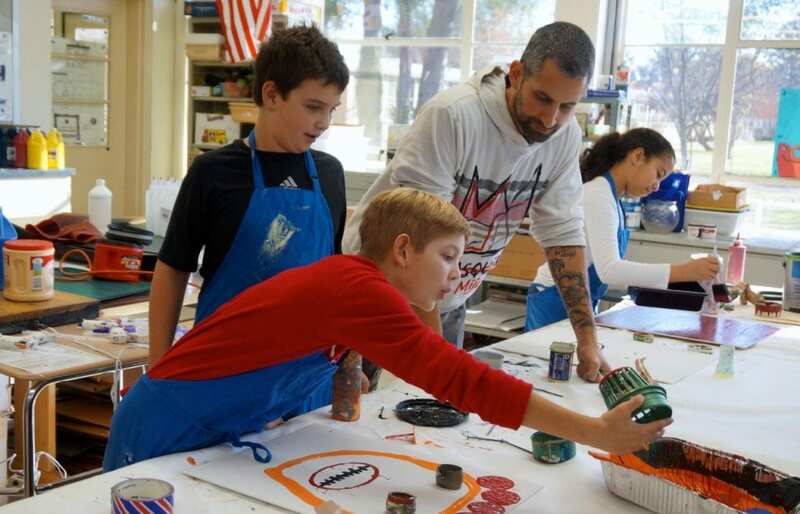 On Tuesday he worked with the students inside the classroom, on canvases that Grindle said will ultimately be joined together in a giant, eclectic, industrial-style mural and displayed somewhere in the school, perhaps the cafeteria. In one class Michaud demonstrated how to use things like cans, washers, ketchup bottles to create faces. “You can create different shapes for the heads, use nails to create hair,” he told the students. 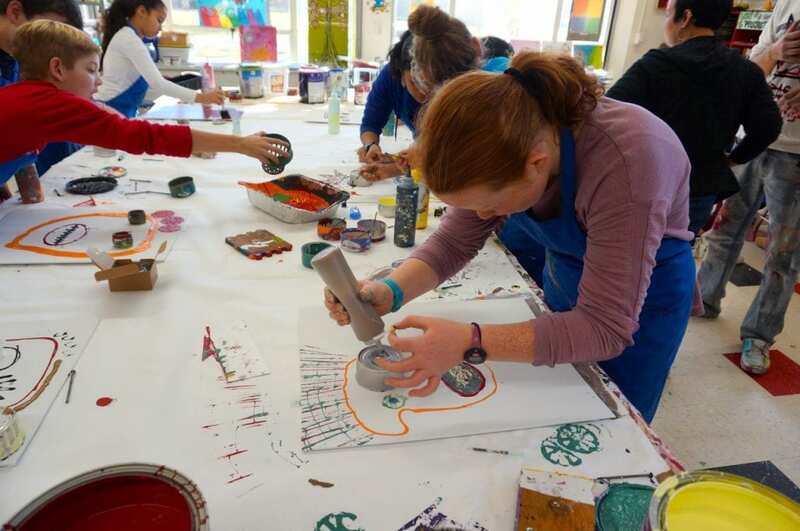 Grindle said that each class period did a different type of project – trees, patterns, portraits. She said she will consult Michaud when the canvases are ready to be joined. Grindle said that she was introduced to Michaud’s work when she acquired a piece in a scavenger hunt in Enfield, where they both live. The piece came with a caveat to pay it forward, which she did. She then became a fan, following Mijumi’s social media accounts, and applied for the grant to bring him to her classes. She said that she loves that Michaud respects the students’ work enough that he will keep it on his car. She said that she thinks it’s important to introduce the students to a contemporary working artist, who makes a living from his art. For more information about the artist, visit his website. .